Home Order Fulfillment Automation Solutions. Complementary Applications. Order Finishing Systems. Maximize service levels with integrated, turnkey automated order fulfillment systems. Pair LP Pick and/or LP Put light-directed picking technologies with a variety of end-of-line automation for complete pick, pack and ship solutions. Your customized order finishing system package includes full deployment of integrated software and controls to optimize outbound order fulfillment throughput and productivity. Lightning Pick works with your material handling equipment and system integrator partners (or ours) to deliver solid state, ready-to-work automation. Lightning Pick products work with many leading brands of hardware, controls, software and warehouse control systems (WCS) for a perfectly synchronized fulfillment process. Automated product bagging and boxing. Document insertion of packing slips and collateral — including catalogs, coupons, special offers, shipping information and other customer-specific materials. Brand-on-demand systems for package personalization. Material handling system software and controls. Lightning Pick’s put-to-light system, integrated with Automated Packaging Systems’ auto-bagger, provides a complete order sortation and packaging solution ideal for e-commerce, direct-to-consumer and other order fulfillment operations. Lightning Pick’s sister Matthews Automation Solutions’ brand Pyramid is a leading provider of warehouse control systems (WCS) plus advanced software and controls for material handling system optimization and management. When a leading retailer of apparel and beauty products sought to introduce compliance labeling and automate shipping label printing and application, the company turned to Pyramid. 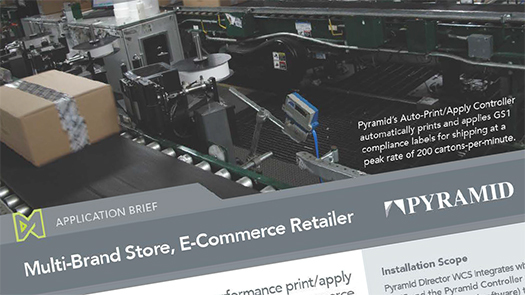 Read how Pyramid’s high-performance print/apply labeling system for store deliveries and e-commerce fulfillment improves the company’s outbound supply chain.